"Nothing has been done by Pope Francis or the Bishop of Abu Dhabi to get me released, in spite of contact being made by my captors." — Rev. Tom Uzhunnalil, a Catholic priest who was kidnapped on March 4, 2016 in Yemen, when Islamic terrorists raided a nursing home and killed 16 people, including several nuns and aid workers. "Christians continue to be the most persecuted believers in the world with over 90,000 followers of Christ being killed in the last year." — Massimo Introvigne, prominent statistician and researcher, interviewed on Vatican Radio. As in previous years, the month of Christmas saw an uptick in Islamic attacks on Christians — much of it in the context of targeting Christmas festivities and worship. "I found bodies, many of them women, lying on the pews. It was a horrible scene. I saw a headless woman being carried away. Everyone was in a state of shock. We were scooping up people's flesh off the floor. There were children. What have they done to deserve this? I wish I had died with them instead of seeing these scenes." The death toll and severity of the attack (pictures and videos of the aftermath here) surpassed even the New Year's Day bombing of an Alexandrian church in which 23 people were killed in 2011. A few weeks before the St. Peter's bombing, a man hurled an improvised bomb at St. George Church, packed with thousands of worshippers, in Samalout. Had the bomb detonated, casualties would likely have been higher. In a separate December incident, Islamic slogans and messages of hate — including "you will die Christians" — were painted on the floor of the Virgin Mary church in Damietta. 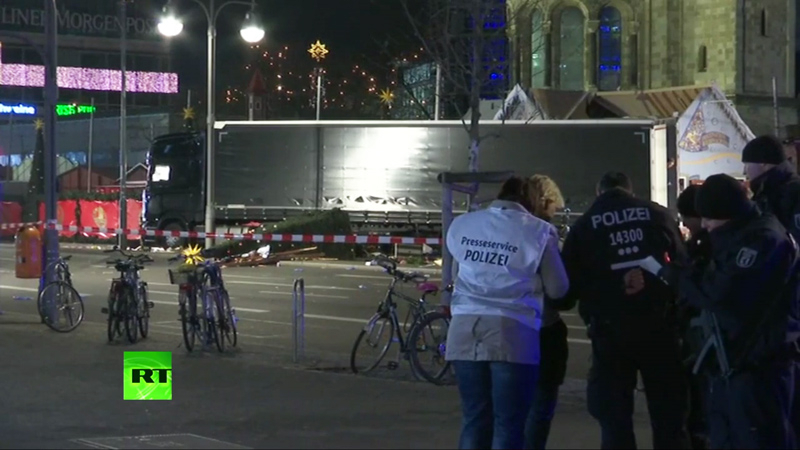 In Germany, Anis Amri, a Muslim asylum seeker from Tunisia, seized a large truck, murdered its driver, and pushed him onto the passenger seat, then drove the truck into a Christmas market in Berlin. Twelve shoppers were killed and 65 were injured, some severely. Four days later, Amri was killed in a shootout with police near Milan. ISIS claimed responsibility despite original reports claiming the man had no ties to Islamic terror groups. In Turkey, a gunman dressed as Santa Claus entered a nightclub in Istanbul during New Year celebrations and shot 39 people dead, and several dozens wounded. The Islamic State later claimed the terrorist attack and portrayed it as an assault on Christian infidels and their Muslims sympathizers. An ISIS spokesman said that a "heroic soldier of the caliphate ... attacked the most famous nightclub where Christians were celebrating their pagan feast," and partly for Turkey being "the servant of the cross." Separately, and ironically, Turkey's National Ministry of Education issued an email to about 35 German-funded teachers in Istanbul. It said: "No more Christmas celebration and/or lessons on Christmas including carol singing is permitted, effective immediately." A report adds, "That Turkey is the homeland of the real 'Santa Claus' is an irony largely lost on most media: St Nicholas, who secretly left gifts for poor children, was in fact Bishop Nicholas who lived in c.300 AD" -- in formerly Christian Turkey, before Islam overran it. In the Philippines, as Christians were celebrating Christmas Eve Mass in a Catholic church in Mindanao, a grenade exploded by the entrance. Sixteen people were wounded. According to the report, "No group has claimed responsibility for the Mindanao attack, but Muslim rebels and Islamist extremists are known to be active in the province, where there have been blasts in the past." On Christmas Day in Cameroon, an Islamic suicide bomber targeting Christians killed a young student and a woman, and injured five others, in an attack on a market full of Christmas shoppers in Mora. Authorities said the bomber, who also died in the attack, was from the Islamic terror group, Boko Haram, based in neighboring Nigeria. They also said that the casualties would have been much higher had a "vigilance committee" not spotted the jihadi, who was pretending to be a beggar, and prevented him from entering the crowded market. During Christmas weekend in Baghdad, Iraq, two Christian shops were attacked with gunfire. Three were confirmed dead; local activists say as many as nine were killed. The shops were presumably targeted for carrying alcohol. "What a bloody gift they gave us for Christmas," Joseph Warda, a human rights activist, said. A Muslim migrant in Italy who, according to police, "wanted to destroy Christian symbols," set a church nativity scene on fire and destroyed a separate statue of Mary. He was caught by the church's priest, who notified authorities. They rushed to the scene and fought to restrain the man. who was reportedly suffering from a "visible psycho-physical crisis." A fortnight before Christmas in a region of Germany that contains more than a million Muslims, approximately 50 public Christian statues (of Jesus, Mary, etc.) were beheaded, and crucifixes broken. Many local Germans were left "shocked and scared," the report said. Police called the incident a "religiously motivated attack." The Islamic State published the names and addresses of thousands of churches in the United States and called on its adherents to attack them during the holiday season, according to a message posted late-night Wednesday in the group's "Secrets of Jihadis" social media group. One Arabic-language message called "for bloody celebrations in the Christian New Year" and announced the group's plans to mobilize lone wolf attackers to "turn the Christian New Year into a bloody horror movie." Manuals for the use and preparations of weapons and explosives for aspiring assailants were also available on the same social media site. Police in Australia arrested seven men — described as "self-radicalized" and "inspired by the Islamic State" — for planning a series of bomb attacks in the heart of Melbourne on Christmas Day. Among their targets was St. Paul's Cathedral. Four hundred police were involved in the raid, and more were deployed on Christmas Day as a precautionary measure. In Pakistan, 43 people, mostly Christian, died, and another 120 were hospitalized, after they drank tainted alcohol at a Christmas celebration. Joseph Arshad, Christian bishop of Faisalabad, while visiting the sick in the hospital, said, "This tragic event turned the joyous festivity of Christmas into mourning with many lives still hang in the balance due to critical conditions" of many patients. A judiciary inquiry needs to be conducted to bring the perpetrators to justice." Yasiini Mugoya said he returned home and shared the gospel of Christ with his fellow Muslims early on Christmas morning. "They started beating me and forced me to lead them to the church compound where the Christians had prayed for me and I had received salvation and healing. When we arrived at the church, the Muslims started attacking the church members." In Indonesia, Muslims yelling "Allahu Akbar" stormed a building where hundreds of Christians were lighting candles and singing "Silent Night" as part of a Christmas service, and forced the celebrations to be stopped. The pastor had just said "Christmas is not a day for hatred but Christmas is a day for reconciliation and peace." Separately, the nation's military and paramilitary personnel — a total of 150,000 people — were on high alert as militant Muslims stepped up their anti-Christmas threats. Security forces killed three Islamic terrorists discovered with bombs which they had apparently been planning to use; another dozen or so Islamic terrorists were arrested also for planning Christmas attacks. Anti-terrorist forces in Bangladesh foiled a planned suicide attack on a Catholic church during Christmas. The conspirators, who belong to the "New Group of Mujahidin," planned to bomb Holy Spirit church in Dhaka, the capital, but were tracked and arrested on Christmas Eve. Authorities from Christian-majority Kenya said intelligence revealed that Al-Shabaab, an Islamic terror group in neighboring Somalia, was planning a series of terrorist attacks during the Christmas season, and would include houses of worship. The nation was placed on high alert; citizens were asked to be vigilant and report suspicious activities. In Yemen, on Christmas Day, a video was released of a Catholic priest who was kidnapped on March 4, 2016, when Islamic terrorists raided a nursing home and killed 16 people, including several nuns and aid workers. In the video, Rev. Tom Uzhunnalil, who appeared weak and out of breath, said "Nothing has been done by Pope Francis or the Bishop of Abu Dhabi to get me released, in spite of contact being made by my captors." He also implored the Catholic pope: "Dear Pope Francis, dear Holy Father, as a father please take care of my life." South Sudan: Flyers and posters were found plastered on churches all throughout the country during the Christmas season. They contained anti-Christian rhetoric and "included calls for Muslims to neither visit nor congratulate their Christian neighbours on the festive season," said a report. More stories of Christian experiences under ISIS continued to emerge in December. "I just want to go home," said 80-year-old Victoria Behman Akouma, now in a refugee camp. When ISIS took over her town in August 2014, "They asked me to convert to Islam, but I told them I will die a Christian and that they can kill me if they want to." Based on the findings of Massimo Introvigne, a prominent statistician and researcher in Italy who was interviewed on Vatican Radio, "Christians continue to be the most persecuted believers in the world with over 90,000 followers of Christ being killed in the last year," in 2016 alone; this comes out to one death every 6 minutes, the majority of which occur in Africa. Austria: A 22-year-old Muslim asylum seeker from Afghanistan stabbed a Christian woman with a knife for reading from the Bible in the asylum center. According to the report, the man "had taken offence to the fact that the woman had been invited by Christian residents of the property to discuss the Bible. When he found out what she was doing, he stormed into the kitchen where the woman was standing and tried to plunge the knife into her upper body." The 50-year-old woman's thick winter coat deflected the knife...."
Democratic Republic of Congo: In a region where Islamic terrorists associated with the Allied Democratic Forces are highly active and where many people of the Christian-majority nation have been killed, a young nun was shot dead in her office. According to the pontifical institute's World and Mission magazine, Sister Marie Claire joins a growing list of clergy in Africa "who have given their lives for the Gospel." Greece: Unknown vandals set fire to the Church of Archangel in the village of Lagolio, on the island of Crete. The only clue to their identity was that they wrote "Allahu Akbar" in Arabic on the walls, "infuriating locals," said a report. Although local residents managed to put out the fire before it spread, icons and other sacred items were burned. Uganda: Muslim relatives beat a 30-year-old former Islamic teacher unconscious, after he publicly confessed that he had converted to Christianity. Then, on December 8, Muslims attacked his 60-year-old mother who, after visiting and listening to her son, also embraced Christianity. The men gashed her head open and broke her hand. Separately, Muslims destroyed the home of a single mother because she converted from Islam to Christianity. On December 23, she received a letter in Arabic reading, "Be warned that if you do not return to Islam, then your days are numbered. We do not want to be associated with infidels. You have become a disgrace to Allah and the Muslim community at Kitoikawononi." The next day, Christmas Eve, Muslims came and razed the woman's home to the ground. Her three children and she are now homeless. Indonesia: A man entered an elementary school in East Nusa Tenggara (NTT), walked to the back of a classroom and began stabbing children. Seven children were injured. The man, reportedly a Muslim, recently migrated to the largely Christian village. Angered villagers stormed the police station, overpowered the police, and killed the attacker. Again separately, a group from the Islamic Defenders Front (FPI) stormed and threatened a car dealership that had asked its employees to wear Christmas themed outfits. Pakistan: A Muslim man beat and kicked a 58-year-old Christian woman unconscious after she refused to clean his home because she was already overbooked with two other homes. "She offered to come back another day with a team of a further two cleaners, however the landlord wanted his home cleaned immediately," said a report. When Bashiran [the woman] refused, stating that she was too old to take on another job, especially of this size on her own, Afzal [the man] became angry. He glared at Bashiran and accused her of disrespect as Christians should not be refusing to take orders from Muslims. Bashiran was pushed to the floor, and Mr Afzal began kicking and punching her until she became unconscious." Police refused to register the crime; when the family pressed the case, the Muslims threatened to kill the Christian family unless they dropped it. In still another separate incident, a Christian boy was videotaped being publicly beaten for drinking water from a fountain located inside a mosque. The video shows the boy yelling and screaming after being whipped with wooden sticks and beaten with shoes. Egypt: A "reconciliation meeting" was held by top officials in Naghameesh, where a building Christians were using to hold church services was torched by angry Muslims. Although the "brotherhood of all Egyptians" — Christians and Muslims — was the main theme, when it came to the question of giving their fellow Christian brothers the same right to worship, the majority of Muslim leaders and family members at the reconciliation meeting continued to refuse them a place in which to pray. Authorities submitted to the decision and did nothing to support the Christians. "We don't understand what is so dangerous about the Copts praying and exercising their legal rights in this matter," one local Christian said. Separately, but around the same time, the Egyptian government boasted that it is opening 10 new mosques every week; that there are 3,200 closed mosques that need renovating; that the government is currently working on 1,300 of them; that it will take about 60 million Egyptian pounds to renovate them, but that the government has allotted ten times that much, although a total of three billion is needed, and that the Egyptian government is dedicated to spending that much — for "whoever abuses public funds [which should be used for Islamic worship], enters a war with Allah, " according to Dr. Muhammad Mukhtar Gom'a, Minister of Awqaf (endowments). But when the nation's more than 10 million Christian minority seeks to build or renovate a church — and pay all expenses from their own pockets — Muslims riot and authorities submit. Iran: "Between May and August 2016 security forces arrested at least 79 Christians," said a December report, even though "the true number of Christians apprehended by the authorities could be notably higher," because "many" arrests are never recorded. "At the time of writing some of these 79 Christians remain in detention and have still not been formally charged." A national policy prioritizing peaceful religious groups for immigration that includes Sufi's and Ahmadi's would allow the Trump Administration to help persecuted Christians while being able to withstand criticism that he is anti-Muslim. Of course, the Sufi's and Ahmadi's would have to be carefully vetted to make sure they will back the Constitution, but they are highly persecuted and object to the actions of the Sunni's and Shia's. The politicians refuse to see terrorism for what it is, and deal with it accordingly. This is not a matter to be taken care of by policemen and courts, but a war to be fought aggressively. Everyone involved with terrorist organizations (and the various intelligence agencies know a great deal about them), not only those involved in attacks, but those fund them and protect them, and those who propagandize for them, need to be hunted down and killed. Countries that have foolishly abolished the death penalty need to restore it, and hang those who are caught. Rather than the public being in fear of an ever-increasing scale of terrorist attacks, the terrorists (and, even more, their supporters) should be in fear of anyone finding out what they're involved in, and paying for it with their lives. We need to terrorize them. Re: "While not all, or even most, Muslims are involved, persecution of Christians by Muslims is growing." Not most or all Muslims are involved simply because most Muslims still live next to other Muslims, and rarely see any infidels - which the Qur'an itself mandates they hate and oppress. EVERY IMAGINABLE CRIME IS OFFICIALLY COMMANDED TO BE COMMITTED BY ALL MUSLIMS AGAINST ALL THE NON-MUSLIMS IN THE WORLD FOR ALLAH! 9:120 promises Muslims that any hardship endured in aid of trespassing against disbelievers will be imputed to them by Allah as a righteous good deed. Unk, you left out an important clause belonging to 9.120 "they take any step to raise the anger of disbelievers nor inflict any injury upon an enemy". That clause is conjoined the the conjunction nor. We have a name for steps taken to injure or enrage: terrorism. Further, you didn not mention the importance of good deeds imputed to the Mujahideen; I call them Brownie Points. On Resurrection Day, Hajar al-Aswad will appear beside Allah, with eyes and a mouth. It will fink on the Muslims appearing before Allah, who will weigh their sins against their righteous good deeds. The Muslim's eternal destiny will depend on the tilt of the balance. When Muslims punish Christians for not being Muslims, they earn Brownie Points to seigh against their sins. 2.114 & subsequent context and 321...3.56 warn of severe torment in this world for disbelievers; who whill torment them and how? Who can get a clue?? Offensive Jihad is fard al-kifaya. Since our invasion of Afghanistan in retaliation for the Accursed Abomination, the Jihad obligation is fard ayn: individually binding. The Ummah is like a bee hive. What can be done about it? Raymond, thank you for your continued efforts to expose the religion of Islam for what it is, a religion of violence toward all others....! Supporting a religion that is anti-Semitic, anti-Christian, anti-Taoist, anti-Hinduist and anti-anything other than itself is supporting a global culture/nation/society killing machine. It is "the only religion in the world" that is incapable of coexisting with other religions, it must dominate and eliminate everywhere it spreads. This is the true dark vision of Islam, they pray to a black box from anywhere they are in the world. They walk around the black box counter-clockwise. It is an invading counter-culture to any society or country that it spreads to. Regional Peace processes will never work because of the absence of the "true Religious Peace process" absent within the religion of Islam. Islam is "Infiltrating Societies Liquidating Anti-Muslims"...!! It is real and a nation killing proto/military machine. Until the world recognizes this fact and requires it to denounce terrorism from its internal radical wings toward other religions and peoples of the world and Jihad from its tenets, "it" Islam should be recognized for the terrorist promoting religion that it is! In Islam, jihad (holy war) is allowed to "defend Islam," narratives need to be provided to give the impression that Islam is being attacked. Islam is the actual attacking religion, toward all others. What is the spiritual origin of darkness and evil in the world? This is the driving force behind Islam and why it is difficult to stop. All nations and religions of the world need to recognize this and view the whole religion for what it really is...! I wondered when this list would end, then I realised, it never will! It will continue to grow as long as the politicians refuse to see what is right in front of them. Pathetic. Most of these politicians don't deserve their office, they are not doing their duty to their own citizens. A mass change to culture and belief is underway, with Christians either moving out of areas, being forced out, or being killed by religious Muslim fanatics. The politicians respond with lies and deceit, as does the media. It's funny that governments will ask for recruits to serve in the armed forces if there is a foreign war that may affect the country, and yet when there is a direct threat from Muslims within their own society the whole attitude changes and the threat is ignored in case it gives offence to those intolerant people we have been forced to tolerate! The list of outrages by Muslims continues to grow, as does their demands. We, the people, have to keep silent on this issue, or risk being charged with a hate crime. That, of course, doesn't apply to Muslims, they can still spout as much venom and hatred as they wish, and openly. The Muslims now have the free speech we all used to have. If you are forced to verbally keep silent, then you must continue writing and spreading the truth to all regarding what is happening. Many here in America do not believe what is transpiring in the European nations. Many of us do know. We can only learn further of the truth through people such as yourself and Gatestone. We are still mostly free to speak our minds, here. But, there have been some problems in various work places where people have been fired for airing their opinions, especially on facebook. President Trump has a lot on his plate, having to undo the results of decades of political and social apathy. He knows what is occurring in Europe. He is trying to prevent the same from happening to America and is, regrettably, meeting great resistance. That is because many are not aware of the truth or do not believe the truth. Any "religion" that promotes killing, torture or abuse of any not belonging to their own mindset, is not a religion. It is nothing more than a fanatical, well-oiled, killing machine. We, the people have to stop the nonsense when governments will not. Writing is an invaluable tool to spread information when gags have been put on freedom of speech. We all must make the truth known. The alternative is enslavement.